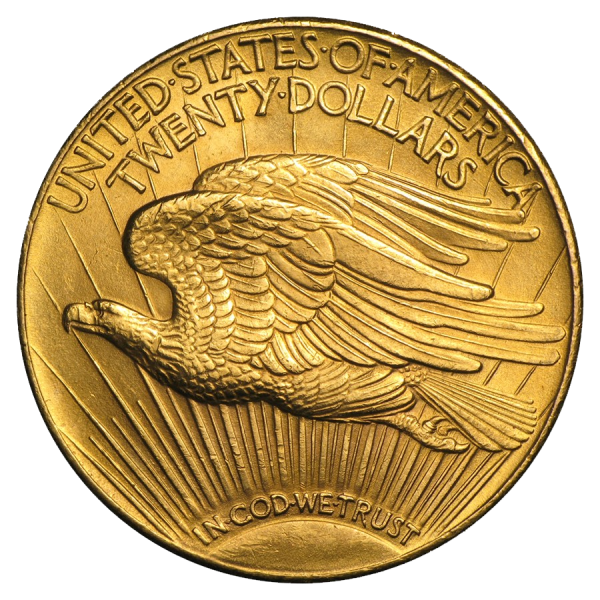 The $20 Saint Gaudens US mint gold was designed by the great sculptor, Augustus Saint-Gaudens. He envisioned an entire new generation of coins that would represent the greatness of an America awakening to its emerging power and importance in the world. It depicts Lady Liberty striding toward the viewer from out of a rising sun, hair flowing, with a torch in her right hand and an olive branch in her left. Obverse: Shows Lady Liberty striding in front of the sun’s rays with a fiery torch in her right hand and an olive branch in her left. Reverse: Features a majestic bald eagle in flight with “United States of America” and “Twenty Dollars” above. Designed by Augustus Saint-Gaudens and minted from 1907-1933.